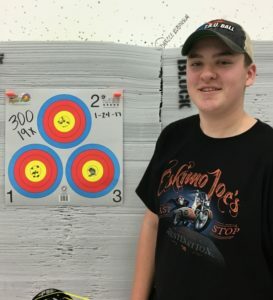 Oklahoma youth archer Parker Franz is having a good week. Parker just took the top prize in the Youth Freestyle category at the Kansas City Shootout Pro-Am tournament. His winning score was his first national-level indoor title. Not one to rest on his laurels, Parker kept up his run by shooting a perfect Vegas 300 round at our local “friendly” league shoot at H&H Shooting Sports. If this sounds like an easy feat, your name must be Mike Schloesser. When asked for his secret, Parker threw a wry grin and said, “Sorry, I can’t tell you.” Nice! However, his secret really isn’t that secret, because I witnessed it for myself: Parker is as cool as ice. The league shoot started like any other, with smiles, trash-talk, and pronouncements of “let’s have fun,” followed by deafening silence as everyone got into their mental zones. About midway through the round, the quiet concentration of our line was shattered by the worst possible sound a compound archer can hear – the “swoosh” of the loosed arrow, immediately followed by a loud CRACK, terrible silence, and then the tinkle of tiny metal parts hitting the floor. Almost all activity on the line ceased, and everyone looked around with dread, searching for the unfortunate victim of what could be a minor equipment failure, a catastrophic bow meltdown, or anything in between. Searching eyes quickly fell on Parker, his intact bow, and his string stop (with associated pieces) arrayed on the floor in front of him. “Ouch!” “Are you okay?” “Man, that’s harsh.” And then a voice of calm and reason from Dad: “No problem. You can shoot without it just fine. Keep going.” So after a bemused look at the neatly sheared-off remnants of the string stop, Parker did just that. The advice that “you can shoot without it just fine” is mostly true. 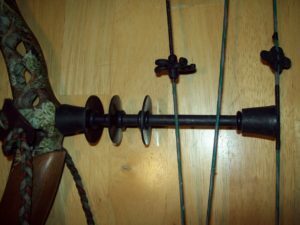 The primary purpose of a string-stop is that of a silencer – it helps to quiet the bow. Mounted on the front of the bow (the side facing the archer), it extends backward until it contacts the string at the brace height, or point of rest. Using a stop made of rubber or some other composite, the device “stops” the forward motion of the string. This arrests the string’s normal back-and-forth vibration that follows the release of the arrow. By stopping that vibration, the attendant noise is also reduced or eliminated. The benefits of a string-stop are most obvious in bow hunting, where silence is golden. But there are benefits to the target archer as well. Less noise makes for a calmer shooting experience. And with less noise comes less vibration, meaning less harshness in the bow hand, less tension in the bow arm, and a more relaxed shooting experience in total. And in target archery, relaxation is golden. The sudden loss of a string stop can have immediate consequences for that relaxation. The bow will be noisier; vibration will immediately be apparent. In addition, the loss of the stop will subtly affect the point at which the arrow nock leaves the string. The tune of the bow (the balance of materials, tolerances, and adjustable settings) can change, affecting how the arrow behaves once it leaves the bow. In short, an archer is dealing with what feels like an entirely different bow. But not Parker. Other than what appeared to be quiet amusement at such an unlikely event, he resumed his calm and seemingly effortless shots. Hardly anyone knew that, up to that point, he had been nursing a perfect round. It wasn’t until that final shot that Parker’s composure changed with a small fist pump and an almost subvocal, “300! YES!” To say that his fellow shooters were impressed is an understatement. So Parker’s secret is really no secret at all. It’s something that we say to ourselves, and our coaches say to us, repeatedly – keep your head in the shot. Do it even if all around are losing their heads – or even if your bow is shedding parts. Don’t worry, Parker – your secret is safe with us!